The Digitech EX-7 Expression Factory takes expression pedals to the next level. It starts by giving you seven modeled pedals in one, then adds seven distortion models, flexible output, and volume pedal capability. All of this comes in a ruggedly-built steel enclosure. Famous wah pedals like the Dunlop Cry Baby and the Vox Clyde McCoy are faithfully reproduced and completely adjustable. Also on tap are a legendary rotary-speaker model, a highly configurable flange, a classic early chorus effect, and two of Digitech's own contributions to the effects world--a whammy pedal setting and a synth swell effect. For even more control, plug the optional FS3X footswitch into the jack and you can switch between effects as you play. With its array of effects and flexible signal routing, the Expression Factory provides a wide palette of sonic choices in a compact pedal that's built to take the pounding required by modern music. The choice of which wah pedal to buy can be difficult, since they all offer advantages. Now the choice is easy, since the EX-7 offers several of the finest wah pedals in history, in one sturdy box. As if seven expression pedals weren't enough, seven distortion models, also based on time-tested favorites, can be mixed and matched with the expression pedal models, giving you a wide variety of tonal possibilities. 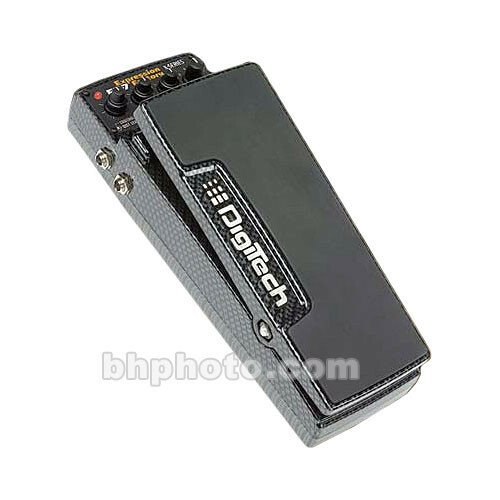 Digitech's Flexible Output gives you two output jacks. Use one for output to a mixer or recording device (with cabinet simulation in effect), or the other for output to an amp (no cabinet simulation). Or combine the two for stereo output. The optional FS3X Footswitch allows you to switch between effect models, and also lets you toggle the distortion on and off, hands-free. The Expression Factory can be easily configured to function as a volume pedal. Box Dimensions (LxWxH) 17.0 x 7.3 x 3.45"